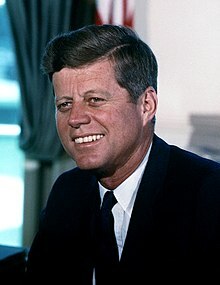 John Fitzgerald Kennedy (May 29, 1917 – November 22, 1963) wis the 35nt Preses o the Unitit States frae 1961 tae 1963, when he was assassinatit bi Lee Harvey Oswald, an succeedit bi Lyndon B. Johnson. Wikimedia Commons haes media relatit tae John F. Kennedy. This page wis last eeditit on 9 September 2018, at 10:19.